(A) Under favorable environmental conditions, the free-living nematode C. elegans stimulates the production of steroid-like hormones (i.e., DAs) that activate the DAF-12 nuclear receptor. DAF-12 activation results in transcription of a metabolic and development gene network that promotes reproductive maturity. 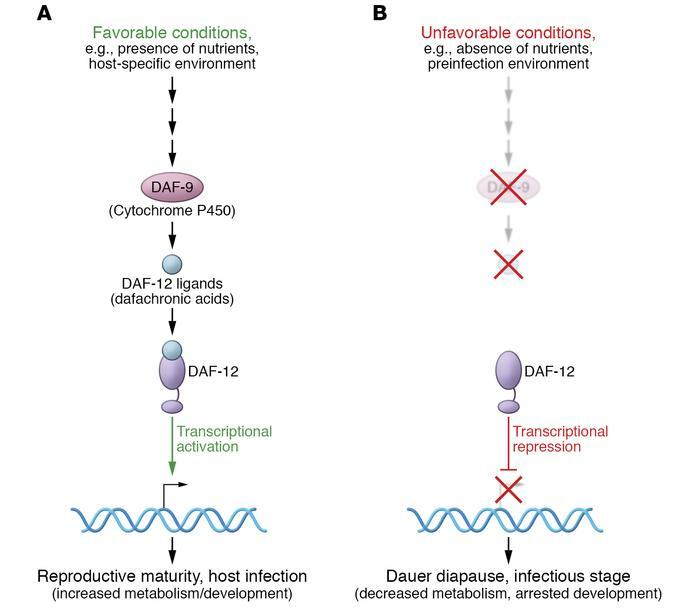 (B) In unfavorable conditions when DAs are not synthesized, DAF-12 functions as a transcriptional repressor of this gene network that results in developmental arrest and entry into the dauer diapause. In helminthic nematodes, this same pathway is believed to govern the development of infectious larvae and the resumption of their development into reproductive maturity after entering their hosts.